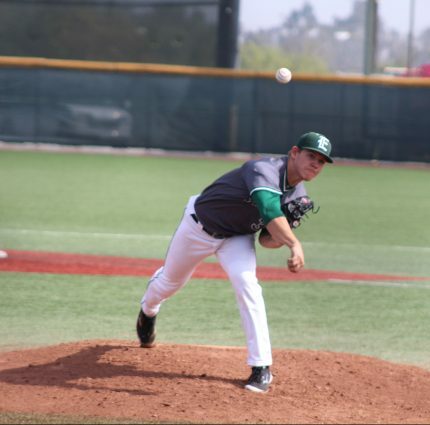 East Los Angeles College baseball swept Rio Hondo College in a three-game series after a 9-3 win away on Saturday. The Huskies won both away games, first with a 6-4 win last Tuesday and again on Saturday to complete the sweep against Rio. ELAC won its home game on Thursday to win the second game of the series against Rio after a close 4-3 win. ELAC and Rio were neck-and-neck in five innings, but in the bottom of the sixth inning the Huskies scored the winning run. Sophomore infielder Zech Jarrad got a base hit and advanced to first base off of a fielder’s choice so that sophomore third baseman Matthew Sosa can score the winning run. “They’re pretty scrappy. You can’t give them (Rio) anything. I didn’t have good games in the past, but I came in today’s game knowing that I was going to do good,” Sosa said. Sosa finished the game with two hits and two runs with three at bats. ELAC freshman pitcher Paul Kosanovich took the win. He pitched eight innings and finished with three earned runs, one walk and seven strikeouts. “I think I did a great job. Throughout the game I hit my spots and let them get themselves out. They (Rio) got a couple of runs which was unfortunate but I hit my spots and they got little jam shots that went through but that’s what happens,” Kosanovich said. ELAC head coach James Hines said that pitching was what won them the game but that they still need to improve in defense. “We could’ve made a couple better pitches and decisions on defense but we pitched well and it gave us an opportunity to win the game by walking only one player and forcing them (Rio) to earn their runs,” said Hines. The Huskies had a one run lead in the bottom of the second inning, after Jarrad hit a run batted in so that sophomore catcher Matthew Shults can score the third run. Rio caught up to ELAC in the top of the fourth inning after sophomore infielder Aiden Gutierrez hit a ground ball to right field so that sophomore catcher Steven Mendoza can score. With a player on first and third base, sophomore utility player Tony Rosario capitalized on the miscommunication between Kosanovich and Shults to bring home freshman infielder David Campbell after a sacrifice bunt to tie the game 3-3. “Our conference games are always going to be tough. We all know what each other do in regard to game planning toward them (Rio) and they game plan for us so it’s a matter of who does a better job of executing and who’s gonna stick to their plan the best. And we’ve done a good job of sticking to our plan,” Hines said. ELAC outscored Rio on last Tuesday’s game early in the first five innings with a 5-1 lead. Rio attempted to make a comeback in the fifth and sixth innings by scoring three runs to cut the lead by one. But the Huskies ended up scoring again in the eighth inning to defeat Rio. The Huskies won the series after Thursday’s victory, but Hines said that ELAC were going to go with the same aggressive mentality that they brought to the first two games. “We’ve been fortunate to jump ahead in both games so far, but now it’s going to be even tougher to try and get a sweep on Saturday,” Hines said. ELAC had a slow start on Saturday’s game and was going exactly how Hines didn’t want it to. By playing catch up, the Huskies defense shined as they shut out Rio in six of the nine innings played. The Huskies finished strong by scoring two runs in the seventh inning, to turn the score around, and scored three runs in each innings eight and nine. After Saturday’s win, the Huskies improved their record in the South Coast Conference-North to 9-5 and sit in the second spot of the table behind Mount San Antonio College. ELAC lost in the first match of another three-game series against Pasadena City College at home, 9-5 yesterday. The Huskies next match will be tomorrow as they travel to PCC to avenge their loss from yesterday in the second match of a three-game series in the SCC-North at 2:30 p.m.